FRI employs a team of seasoned professionals delivering innovative project management and workplace solutions to our commercial real estate and facilities management clients within Corporate, Edcutional, and Government sectors. 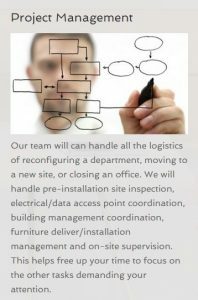 The FRI team offers diverse backgrounds in space planning, move and relocation management, project management and comprehensive furniture management services. Throughout the duration of the assignment, our project management specialists will conduct regular site visits to ensure everything remains on schedule, and we will distribute regular progress reports so you remain informed. To learn more about our project management services and how FRI can provide efficient, cost-effective solutions, call us in Austin (512) 371-1232 or San Antonio (210) 331-1272.